Gifts for Strangers handed out some holiday cheer! 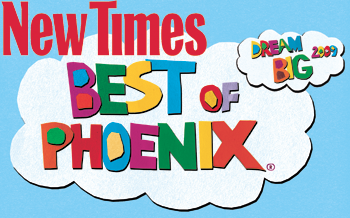 On Saturday, December 15th, Improv AZ and over a dozen agents braved the cold and rain to spread some unexpected holiday cheer in downtown Phoenix as part of Gifts for Strangers. Started by Improv In Toronto in 2010, “Gifts for Strangers, is a world-wide cause to spread kindness and goodwill around the world, just through simple acts.” Groups in 33 cities all over the world gave small gifts to strangers in their communities on the same day. Our agents were motivated to make others happy and give to others with no expectation of anything in return. Several people came with bags of gifts to give and their children in tow. 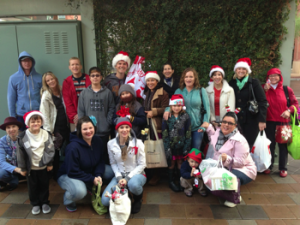 Our agents walked around downtown Phoenix and greeted strangers with “Merry Christmas” or “Happy Holidays” and offered them a gift. Some of them were leery of the surprise gift, but many of them were happy to take our gifts. The children who were offered gifts were ecstatic. Some people were so touched by the gift their eyes filled with tears and they hugged our agents. One agent included money in her gifts. She saw a gift recipient take the $10 that was in his gift and give it to someone else who needed it more than him. We walked the streets giving gifts for about 30 minutes before regrouping to share stories from our gift giving adventures. From all accounts, this flash mob was a huge success. Happy Holidays everyone from the crew at Improv AZ! We hope to see you at our events in 2013!